Outer London has traditionally been viewed as a place of relative affluence with low levels of poverty. Whether this was ever really the case is debatable, but what is apparent are telling signs of poverty increasing and de-gentrification taking hold in some outer London areas. This report, based on data analysis, focus groups with low-income outer Londoners and interviews and discussions with practitioners and experts seeks to understand what might be driving these changes, what the impacts and consequences are and what interventions might be needed to tackle poverty and achieve inclusive growth in Outer London. The report calls for an urgent review of how politicians and policy makers approach prosperity and wealth creation in London. Rather than simply rewarding growth in inner London and encouraging commuting from a cheaper Outer London to an ever more expensive Inner London, the report calls for an alternative policy approach to strengthen Outer London and rebalance London’s economy and housing markets. The report warns that failure to act will lead to a widening divide between Inner and Outer London and risk displacing poverty to Outer London. London is now entering a new era and its leaders will need to plan ahead carefully to deliver the shared prosperity its citizens want. A poorer and more divided city, with an ever-widening gap between a wealthier inner London and a poorer outer London is not an option. As this report argues, renewed efforts are required to secure inclusive and sustainable growth across all London’s boroughs – not a displacement from one area to another. London’s approach to economic development has in recent history focused on growing central London areas to increase agglomerations/clusters of business activity and boost growth. The evidence in the report highlights the downsides to this city-centralist approach for Outer London, which overall has suffered from sluggish productivity growth in recent years behind not only Inner London but also the UK average. The current approach also has potential downsides for Londoners, with people on lower incomes facing higher housing costs while those on higher incomes in Inner London benefit from appreciating housing values. The uneven costs and benefits of agglomeration and city centralism appear to be changing the spatial pattern of economic growth and driving poverty levels up in Outer London while Inner London experiences reductions. 1.4 million people are living in poverty in Outer London – 60% of London’s total. The number of people in poverty in Inner London has risen by 180,000 over the last 15 years. Whilst the proportion of people in poverty remains higher in Inner London, the gap is converging, with rates narrowing from a 12-percentage point difference 15 years ago to seven percentage points in the latest dataset. In 2004 Outer London had 32% of London’s most deprived wards, by 2015 it had risen to 47%. London’s low-income households are at the sharp end of the capital’s housing affordability crisis. This is not solely about market prices but also due to the relative decline of social housing. As a consequence, the private rented sector (PRS) is now home to more people in poverty than social housing. Over the last ten to fifteen years Inner London’s housing has become relatively more expensive than Outer London. Prior to 2006 housing in Inner London was around 20% more expensive than Outer London. Today it is over 30% more expensive. This rise in housing costs, alongside welfare reforms, seems to have driven more low-income people into renting privately in Outer London. Housing Benefit claims in the PRS are up 17% in Outer London but down 13% in Inner London. The list of local authorities with the highest number of housing benefit claimants in the PRS is dominated by outer London boroughs. Those in the PRS in Outer London are most likely to be in overcrowded homes. While Inner London has seen considerable job growth, Outer London has experienced a decline in job density rates (jobs per working-age population). The current job density rate is now below the UK average. Whilst unemployment is often considered a problem concentrated in inner London, there has been convergence in the rates over recent years - so much so that there is now no discernible difference between employment and unemployment rates between inner and outer London. Low pay is increasingly an Outer London issue, with low pay rates a third higher in Outer London than Inner London. Ten years ago rates were similar. Evidence suggests that local jobs matter for employment prospects, with low-income workers unlikely to commute to Inner London. A regression analysis for the report showed that geography is an important factor in employment prospects. Holding for personal characteristics, the analysis shows that Outer Londoners are 15% less likely to be in employment, 40% more likely to be low paid and 50% more likely to be unemployed. Employment in industries that are more likely to provide poor quality working conditions are disproportionately found in Outer London. The evidence suggests creating good quality work close to where people live matters a lot to low-income Londoners. Outer London needs a new vision to ensure it is not squeezed between the new appeal of urban living and the draw of the prosperous home counties. This needs to play to outer London’s strengths and rekindle the vision of outer London as a place of opportunity. It also needs to play on its strengths: as places with a sense of community and cultural diversity identified in the focus groups. There is a need for a new set of metrics to help achieve sustainable inclusive growth for outer London with a strong policy focus on creating new jobs, reducing poverty and delivering affordable housing (and not just from social landlords but also within the private sector). It is not clear how Crossrail 2 will help deliver inclusive growth across London. 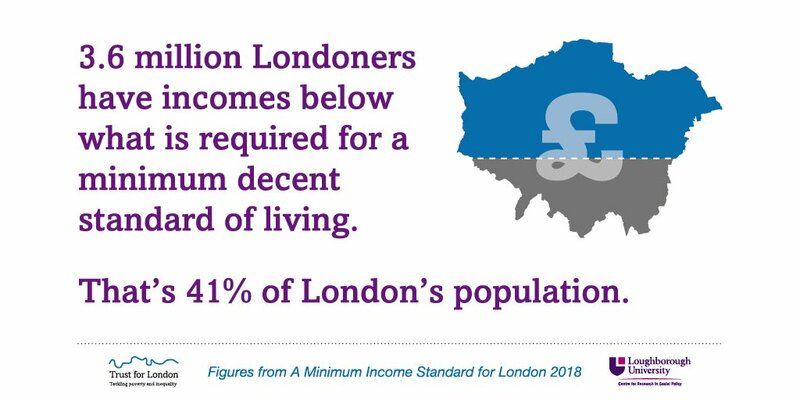 The benefits disproportionately benefit Inner London. The GLA should urgently review the £30bn of Crossrail 2 funding with a view to redirecting investment in support of inclusive growth in Outer London. Such a bold move would begin a shift away from city centrism and provide significant funding to tackle poverty and support good growth in Outer London. The Mayor should appoint a Deputy Mayor for Outer London to be a champion within the GLA, help deliver a new vision for outer London, and ensure growth across the capital is fair and balanced. The Mayor should reboot the Outer London Commission (currently dormant) as an Outer London Inclusive Growth Taskforce. This Taskforce should have a broader remit with a strong emphasis on reducing poverty and increasing opportunity in outer London. Membership of the Taskforce should reflect this broader remit, with more members from civil society. Concerns about the impact of regeneration from outer Londoners was not confined to estate renewal (notably because so many Outer Londoners on low income live in the PRS). The GLA and boroughs should assess the likely impact on people’s rents and the affordability of an area subject to regeneration schemes, beyond those living in social housing estates. To help ensure regeneration works for local people a ‘first dibs’ housing and jobs policy for existing residents should be introduced. There should be a ‘fair work’ convention for Outer London which brings together small and larger employers and trade unions to promote better employment practices and tackle low pay. Good employment standards should be integrated into all publicly funded programmes and the GLA and boroughs should seek to create an accredited list of suppliers. Skill levels of Outer London are lower than in Inner London. To ensure skills training translate into changes to outer London’s low productivity economy, measures should be introduced to ensure those businesses engaging and benefiting from skills provision and business support programmes meet good employment standards. A future strategy for good growth should also be aimed at growing the sectors that are likely to deliver good employment for lower skilled Outer Londoners. GLA and other public funding should where possible be contingent on employers paying staff the London Living Wage. Town centres are at the heart of the economic and civic life of Outer London but have been under severe strain as they adapt to changing consumer patterns. Building on previous initiatives, a dedicated Outer London Town Centres Transformation Fund should be created to help town centres adjust during a period of changes. Strategies and measures to help town centres adapt should include ways of reducing low pay, such as making town centres Living Wage areas. The GLA could seek to work with Outer London boroughs to see whether there is scope for councils to increase ownership of property within town centres, possibly through their own trading companies. Outer London has been disproportionately affected by permitted development rights to convert office space to residential use. Central government urgently needs to reverse this reform which deprives Outer London of office space and of planning gain contributions for jobs and community benefit. There should be a much greater focus from the GLA and TfL on orbital transport networks in outer London to enable inclusive growth and create new jobs in Outer London. The GLA and TfL should undertake a review of blackspots where public transport links to training, education and employment are weakest and where new routes may be required. The majority of Londoners with a disability that limits their day-to-day activities live in outer London. Investment to improve accessibility should be focused on Outer London where accessibility is often worst. To help Outer London tackle low pay and poverty the GLA should look to develop alternative funding and financing tools. The Mayor could support Outer London town centres by raising extra funds from higher business rates in international retail centres in Inner London. Helping people out of low pay delivers additional revenue to the government as it increases the tax take and reduces tax credits and means tested benefit payments. To incentivise efforts to tackle low pay, the GLA should seek to strike a devo deal with central government where the fiscal benefits are shared. Following the EU referendum vote there has been uncertainty about EU funding. Any replacement funds allocated to London by the UK Government should be devolved to the GLA to support policies for inclusive growth. Despite Outer London seeing a growth in the proportion of London’s most deprived areas, funding per head from central to local government has been cut more per head in outer than inner London. Alongside wider efforts to secure funding for London as a whole, a specific case should be made for additional grant funding for outer London boroughs experiencing rising poverty levels.